The work of the group "Simulation of Wave Propagation" is mainly devoted to the analysis of modern numerical methods (such as the finite element method (FEM) and the finite difference method (FDM)) and their applications to various real-life problems. We are addressing both classical FEM and FDM issues (convergence, superconvergence, mesh generation, preservation of qualitative properties of solutions, etc. 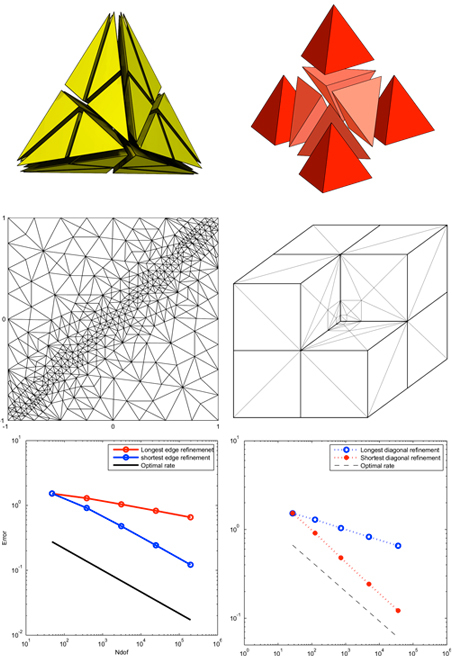 with emphasize on high-dimensional problems and interconnections with discrete and computational geometry) and some recent trends in numerical analysis, such as reliable a posteriori error estimates and efficient mesh adaptivity procedures for stationary and time-dependent problems. In addition, we develop rigorous computational methods to prove existence of stationary solutions, periodic orbits and connecting orbits for system of ODEs like the Lorenz system and PDEs like the Kuramoto-Sivashinsky equation. In terms of applications and implementation, we are dealing with problems related to heat conduction, wave propagation, modeling of fuel cells, computational fluid dynamics, medical image registration and segmentation, and chaotic dynamical systems. Design, analyze, implement and optimize numerical schemes for mathematical models arising from real-life applications. PDE models, numerical analysis, reliable numerical modelling, error control, mesh generation and adaptivity, shape analysis, rigorous computations, interval arithmetic.